Chang Hsin Industry (M) Sdn Bhd - Chang Hsin Industry (M) Sdn Bhd was established in 1975 in Taiwan. We grew prominently to become one of the world leading manufacturers of stainless steel based products. Our main office is located in Kulim, Kedah, Malaysia. Thousand of mountaineers and marine personnel have been using multi – purpose hooks manufactured by Chang Hsin. Chang Hsin (CH) was established in 1975 in Taiwan. Chang Hsin grew prominently to become one of the world’s leading manufacturers of stainless steel based products. Chang Hsin has always operated on the principle of giving the customer the finest in products and services. Each of our employees is dedicated to seek the best in development and production technology. We want the products we offer to be the highest possible quality. We do this because we are committed to our clients, and we are committed to the future. Delivering the best products to clients requires an ongoing effort to improve our operations. For extending sales market and offering prompt on time services. Diversification was inevitable and this saw the birth of Chang Hsin Industry (M) Sdn. Bhd. (CHI). In 1990, the first overseas factory was located in Kedah, Malaysia. Incorporated in 1996, Chang Hsin Decor Kitchen Centre is an accredited supplier, manufacturer and exporter of high quality stainless steel kitchen sinks, kitchen cabinets, sink benches, working tables, and kitchen&bathroom accessories. True to its corporate policy of not resting on its laurels, Chang Hsin began to explore the possibility of manufacturing stainless steel pet cage to capture the huge market for the use of the pets today. In the year of 2011 Chang Hsin takes on the challenge to further soar in achievements with the setting up of its Chang Hsin Pets (CHP). At Chang Hsin Decor Kitchen Centre, our design consultant will work with you to create the plan that’s just right for you and your home. Come and make your design consultation appointment today! 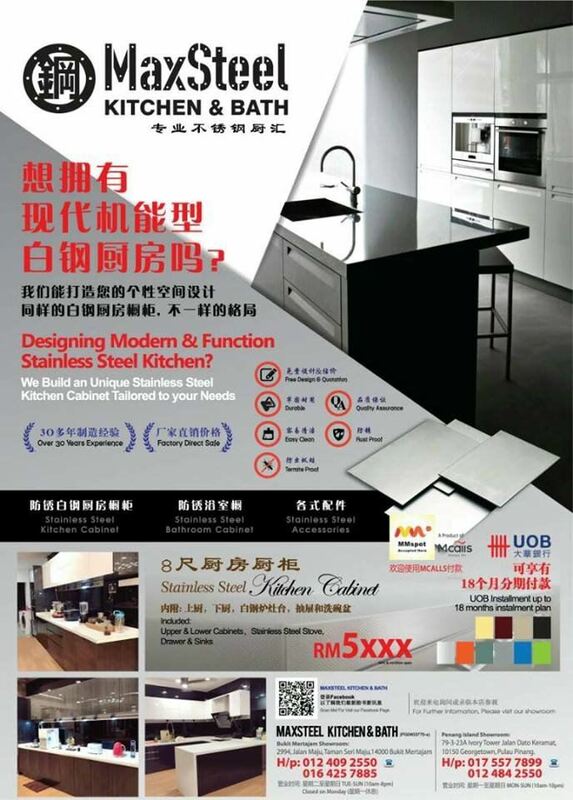 You can view actual kitchen cabinets display in the showroom throughout Malaysia to Singapore. If you are on budget, we provide easy payment scheme to our qualified kitchen cabinet customers. Terms and conditions apply. We are confident that we can find the best solution to meet your needs and also your budget requirement. Please contact us anytime! We look forward to hear from you soon. "The reputation of a company is built on the quality of its products"
Plot 72, Kulim Industrial Estate, 09000 Kulim, Kedah, Malaysia.